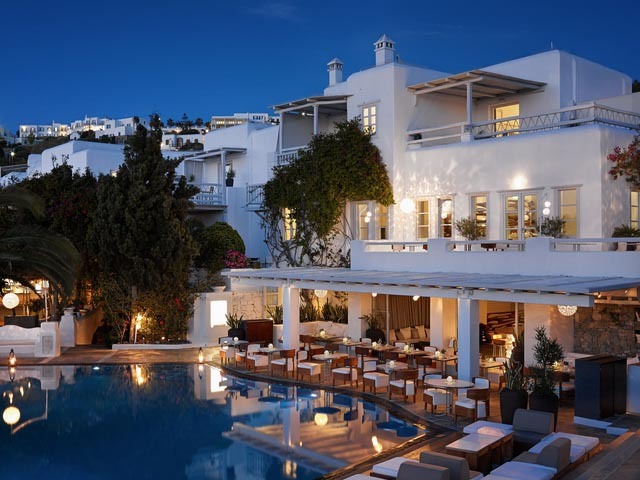 The Myconian Ambassador Hotel is a luxury hotel in Mykonos, capturing the essence of Myconian charm and the celebrated art de vivre of Relais & Châteaux.Mere steps from the fine sand of Platis Gialos, and built in sympathy with the slope, its architecture blends contemporary chic with tones and textures borrowed from the local vernacular.Interiors that embody the clean line and cool sophistication of high design flow into the quiet comfort of luxurious bedrooms, or spill out onto the spectacular terrace that is the heart of the hotel, all without ever breaking the spell of magnificent Aegean views.Aptly named Stay, the terrace is a world unto itself, beating to different rhythms throughout the day: after a leisurely breakfast at Latitudes, mornings drift effortlessly into perfect poolside afternoons, with light meals and drinks from George’s bar. 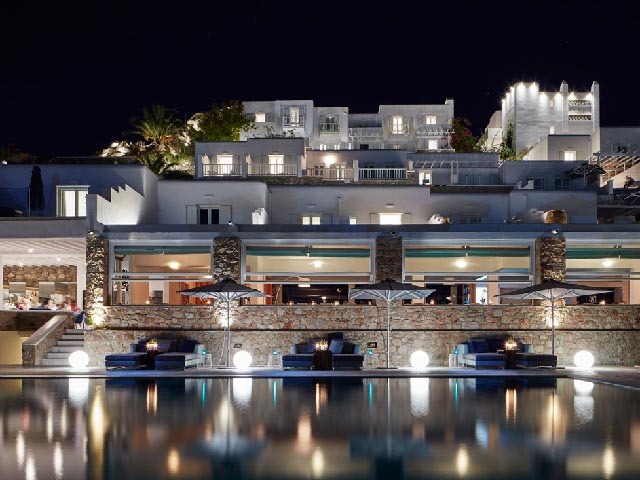 And as shadows lean towards evening, guests return from the beach to mingle over sunset cocktails, before dining in the candle-lit glow of Efisia, one of the island’s top tables. 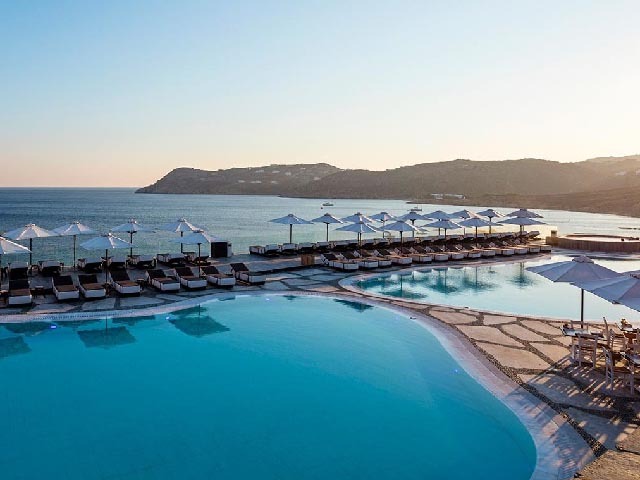 The Myconian Ambassador Hotel is situated just above Platis Gialos beach on the south coast of the island, renowned for its crystal water and fine sands. 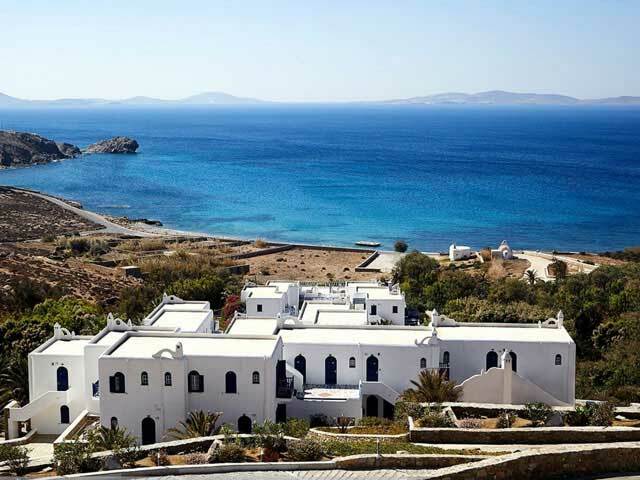 The famous beaches of cosmopolitan Psarou, picturesque Paranga and Agia Anna are within easy walking distance. 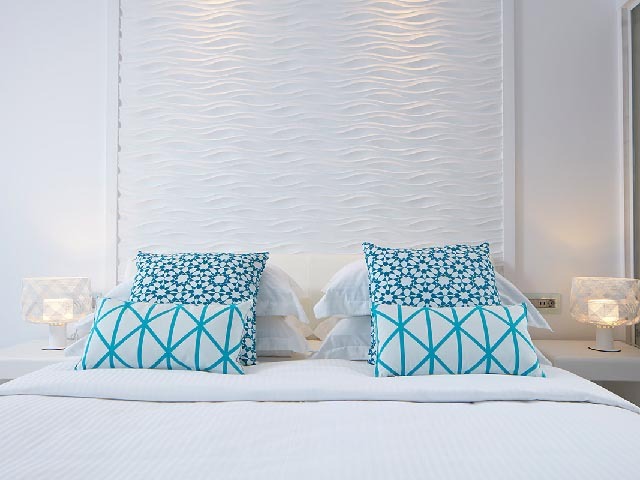 SEA BREEZE ROOM:Step into the contemporary elegance of an open flow room leading onto a private balcony with views of the sea and the surrounding hillsides. Sophistication and comfort are invested in every detail: marble floors and floating shelves, walls and crisp linens all play to the power of pure white, while subtle touches of classic blue are softened by wood accents and superb mood lighting. A Flos designer fitting hangs over the desk like a floating moon, and striking custom lights glow at the bedsides. Coming from the vibrant atmosphere of the outdoors, it is an oasis of quiet intimacy and luxury. 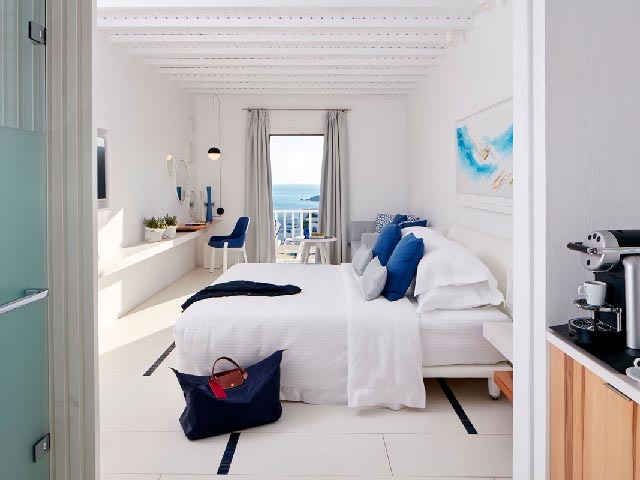 TRUE BLUE ROOM:The room’s contemporary open flow opens out onto a private balcony with endless views of the Aegean. Sophistication and comfort are invested in every detail: marble floors and floating shelves, walls and crisp linens all play to the power of pure white, while subtle touches of classic blue are softened by wood accents and superb mood lighting. A Flos designer fitting hangs over the desk like a floating moon, and striking custom lights glow at the bedsides. Coming from the vibrant atmosphere of the outdoors, it is an oasis of quiet intimacy and luxury. 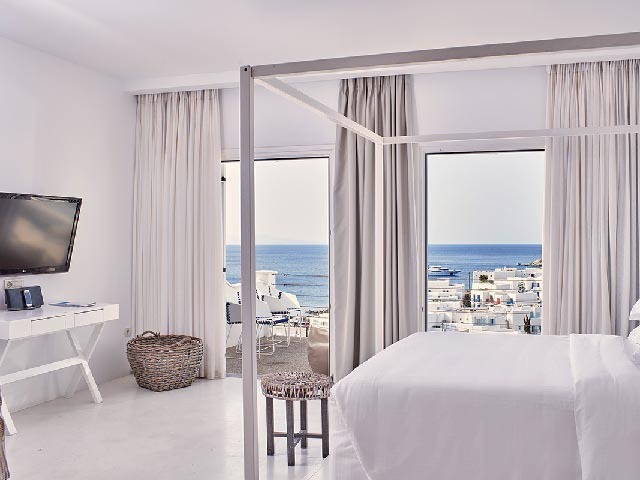 WHITE BLISS ROOM:The spacious elegance of this contemporary ‘open flow’ room expands onto a private terrace with panoramic views of the Aegean. Luxury and comfort are invested in every detail: marble floors and floating shelves, walls and crisp linens all play to the power of pure white, while subtle touches of classic blue are softened by wood accents and superb mood lighting. A Flos designer fitting hangs over the desk like a floating moon, and striking custom lights glow at the bedsides. 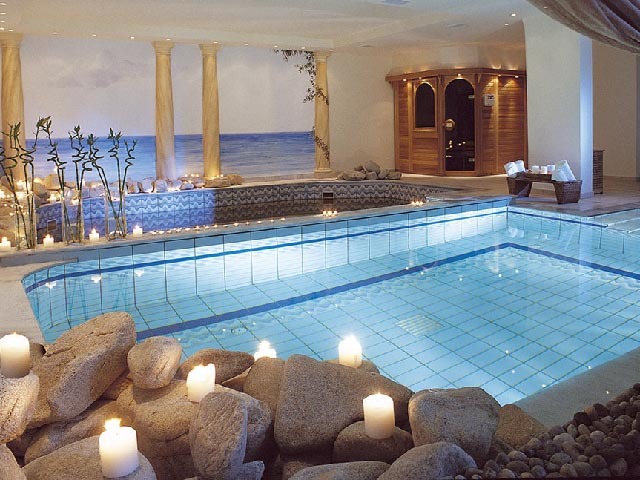 Coming from the vibrant atmosphere of the outdoors, it is an oasis of quiet intimacy and indulgence. 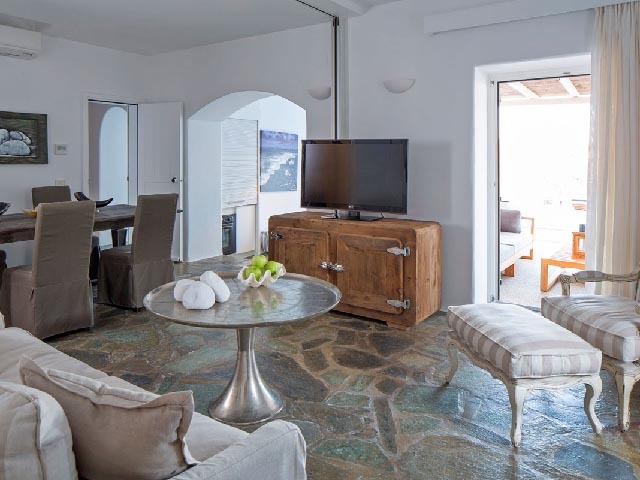 THALASSA SUITE:A luxurious expanse flowing from the contemporary elegance of the room onto a private terrace that commands sweeping views of the Aegean. Sophistication and comfort are invested in every detail: marble floors and floating shelves, smooth walls and crisp linens all play to the power of pure white, while subtle touches of classic blue are softened by wood accents and superb mood lighting. The bathroom experience is pure indulgence, with double sinks, a deep bath, rain shower and amply stocked with luxury cosmetics. A Flos designer fitting hangs over the desk like a floating moon, and striking custom lights glow at the bedsides. 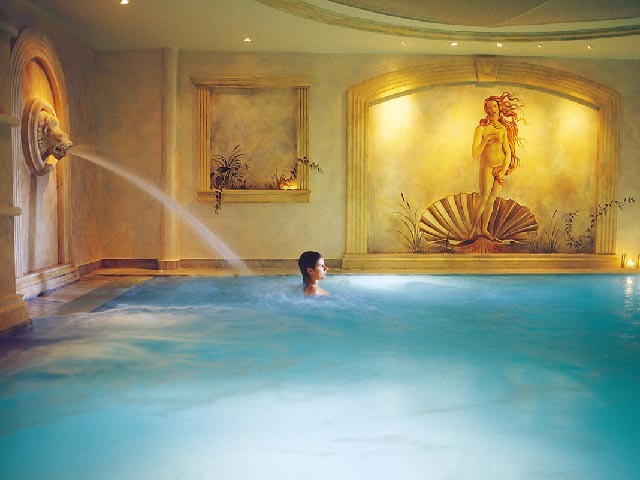 Coming from the vibrant atmosphere of the outdoors, it is an oasis of quiet intimacy and indulgence. 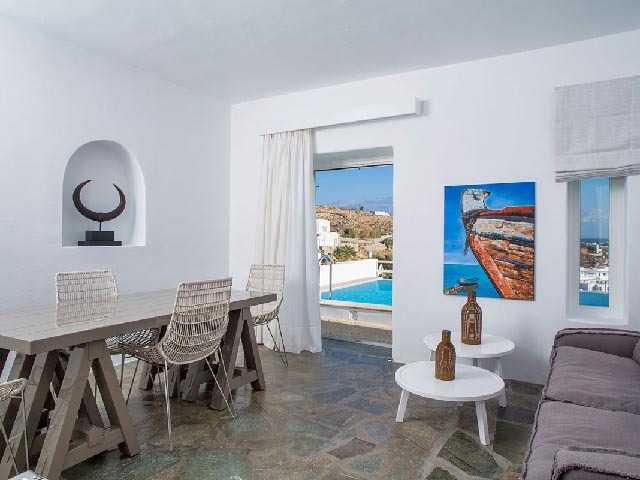 PASSION SUITE WITH PRIVATE JACUZZI:A perfect choice for guests wishing to have a luxury honeymoon in Mykonos, unwind in leisure and enjoy treasured moments in a uniquely romantic setting. 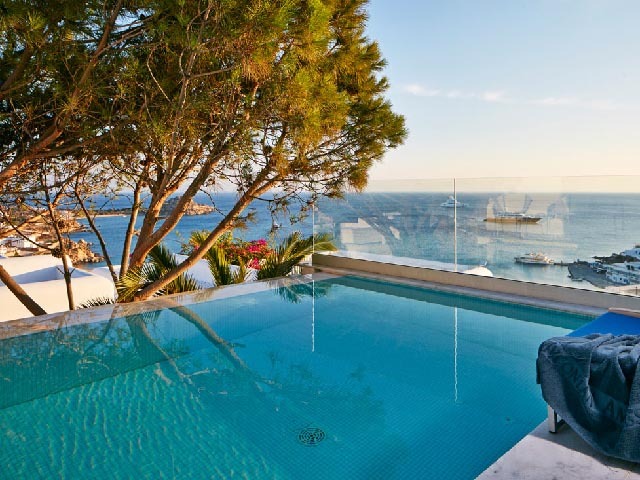 Suffused with discreet luxury to capture the island’s sense of purity, our Honeymoon Suites feature an open-plan living room and a relaxing terrace with outdoor Jacuzzi overlooking the blue waters of the Aegean Sea. One romantic dinner for two at Efisia, our Relais & Chateaux gourmet restaurant, including a celebratory flute of champagne and a bottle of wine to accompany your five-course tasting menu, followed by chocolate enrobed strawberries for dessert. THE VILLA:An exclusive, 8-bedroom paradise built in the evocative Myconian vernacular, with hardwood floors and contemporary interiors that are in harmony with the panoramic views of the bay and the surrounding hillsides, and a spacious outdoor area with landscaped garden that celebrates island living. 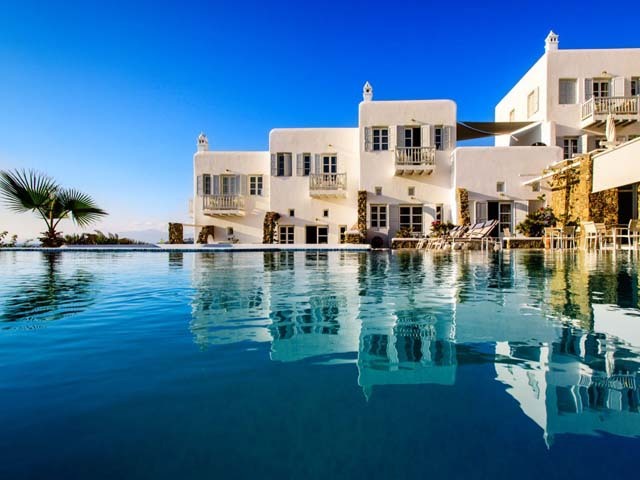 Designed as a private home with every comfort and indulgence in mind, the villa has the ability to transform from an oasis of tranquility and privacy, to the perfect entertainment hub that sleeps up to 22 guests. 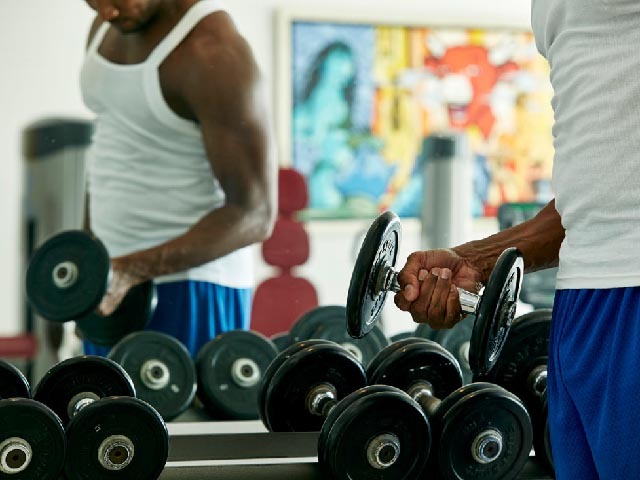 Amenities include a fully equipped kitchen and ironing facilities, a private bar and the high-tech comforts of 3-D satellite Smart television with DVD player, iPod docking station and wireless Internet connectivity. We’ve even added an open wine cellar and private drive-in parking. 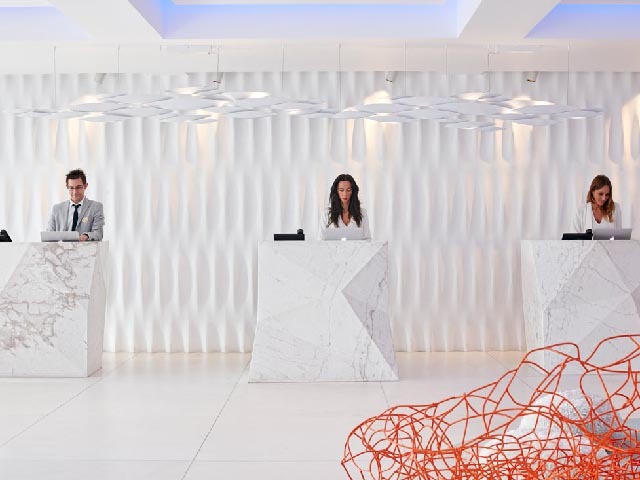 Our ever attentive and discreet housekeeping and our world-class concierge are at your service for special requests. 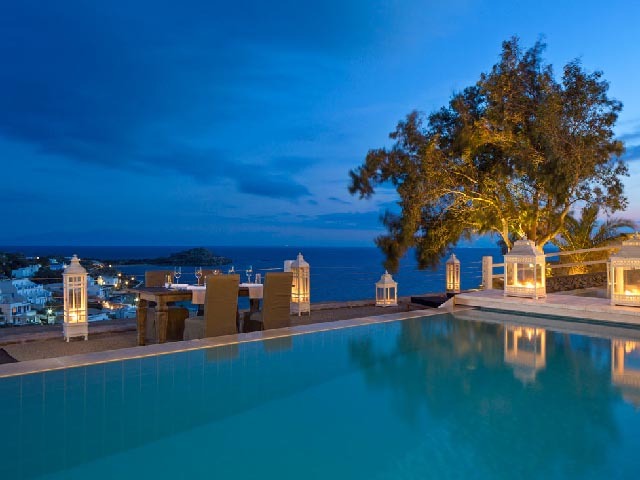 Enjoy a candle-lit dinner on your balcony catered by a personal chef, or a massage on your private deck. Even the unique experience of pilates and yoga instruction in the natural beauty of one of our island’s secret coves, followed by a gourmet picnic prepared by our head chef, is not too much to ask. 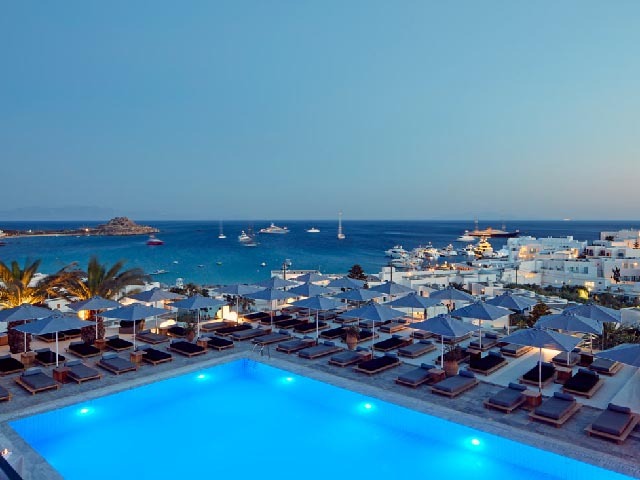 In brief, this is the epitome of luxury on Mykonos. LATITUDES THE BREAKFAST TERRACE:Flooded with morning light and overlooking sea views that spill in through generous windows, Latitudes is the perfect place to start to your day. The lavish spread laid out by our chef includes cooked-to-order eggs and a champagne American breakfast buffet, with freshly baked breads, buttery croissants and cereals (catering to those with the most hedonistic tastes as well as those with gluten-free requirements), pressed juices, fruit, nuts, charcuterie and salmon. 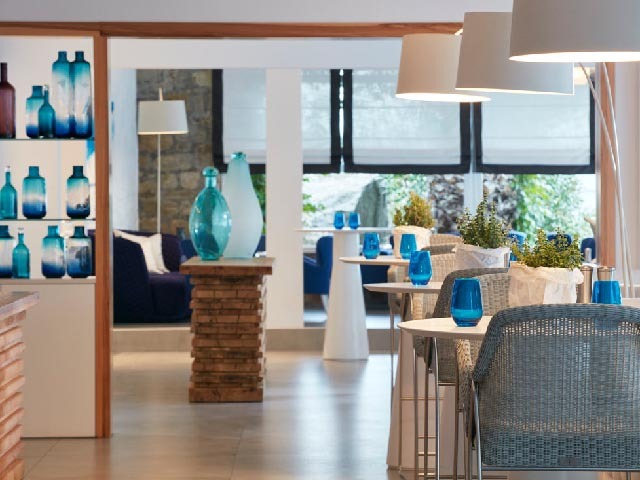 This is complemented by our traditional buffet of local delicacies such as stuffed vine leaves (‘dolmades’), Greek yoghurt with island honey, fresh tomatoes and olives as well as the more indulgent halva, kataifi and baklava. It’s so good that guests who only drifted in at dawn get up just in time to catch the last delicious Italian cappuccino. 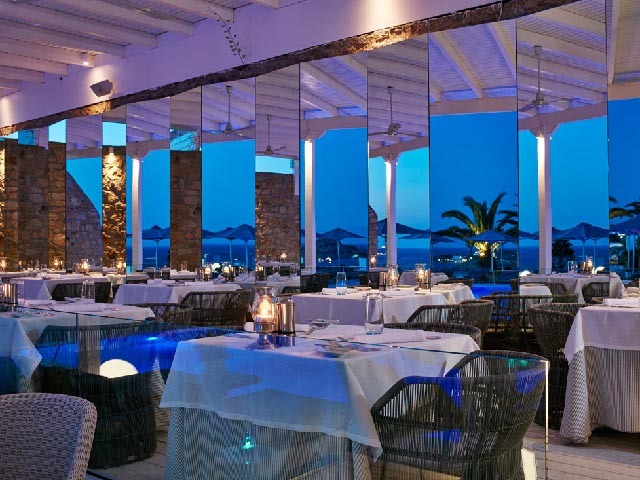 EFISIA FINE DINING:Our restaurant is sheltered from the evening breeze in an alcove of rough-hewn stone. 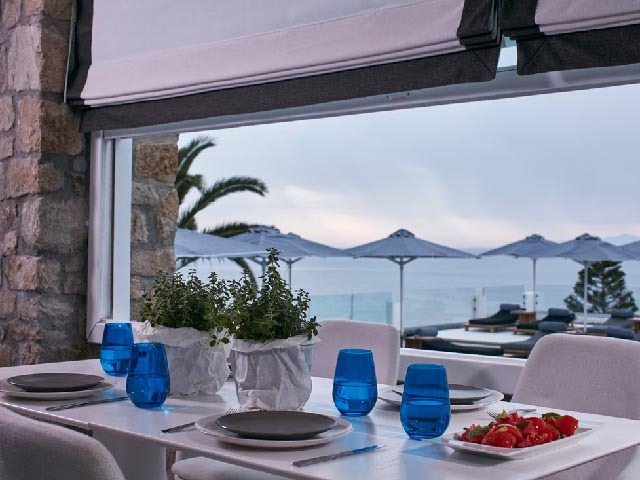 As one of the top tables on the island, Efisia offers a gourmet menu in the Relais & Châteaux tradition, pairing a culinary experience with luxurious atmosphere. Both à-la-carte and a menu dégustation are served between 8pm-11:30pm, complemented by a discerning selection of wines. Bookings are essential! STAY THE POOL DECK:The magnificent timber deck surrounding the pool is a world unto itself. 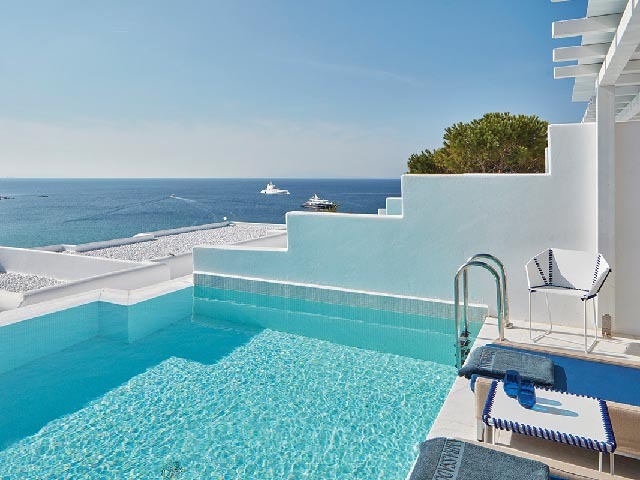 It’s a vast expanse and, once on it, you feel as if you’ve set out to sea on a tide that ebbs and flows from breakfast terrace to poolside bar and back. 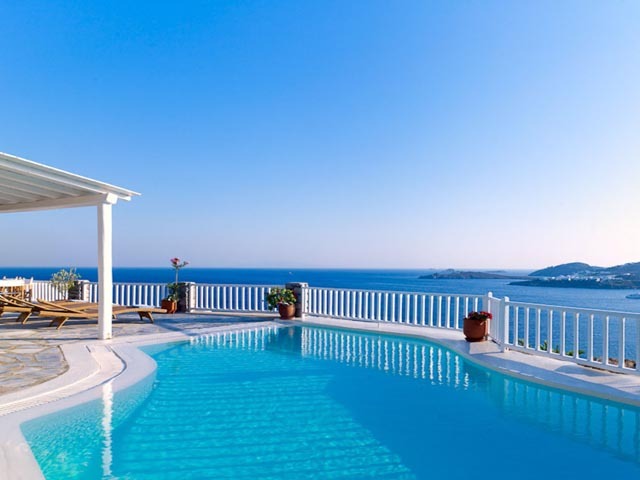 Best of all though are the seamless views out over the Aegean. 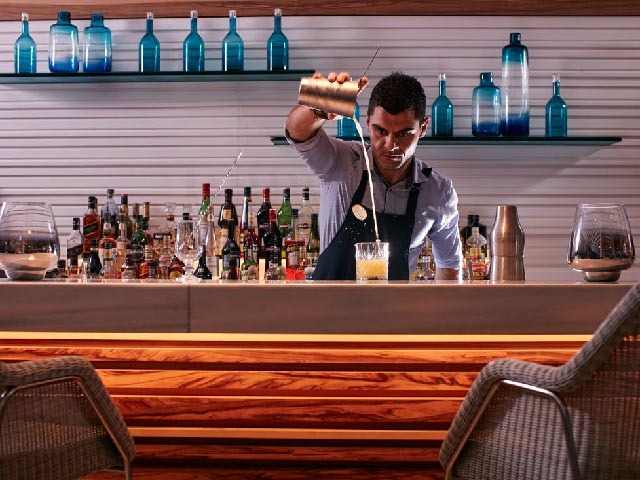 There’s nothing more relaxing than a day spent adrift in reverie or reading on our broad daybeds, cared for by our attentive crew bringing fresh towels, irresistible, complimentary iced smoothies and anything that might catch your fancy from the bar’s menu. You could do nothing at all. 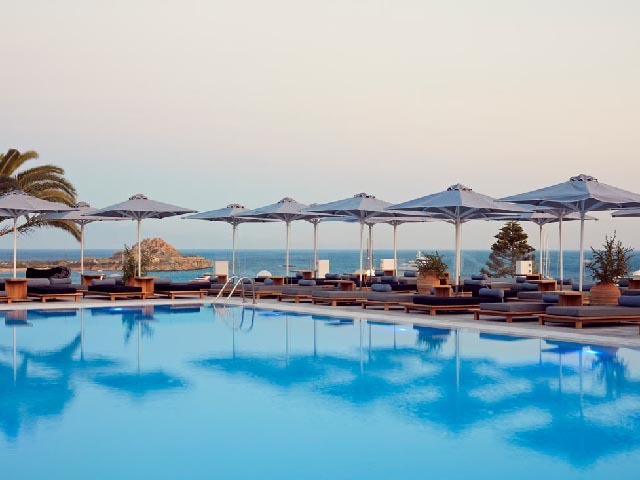 Or why not simply watch the shadows of the palms and the parasols lean into the afternoon until, at sunset, stillness descends on the ocean, bringing with it an incomparable sense of tranquility and wellbeing. Many guests do just that, which is why we simply named it STAY. GEORGE’S BAR:With its panoramic view of the entertainment terrace, George’s is an ideal meeting spot and a perfect vantage point from which to watch the day’s rhythms unfold. Our barman is an old hand at preparing your poison of choice, and you can rely on him to provide the perfect accompanying snacks. 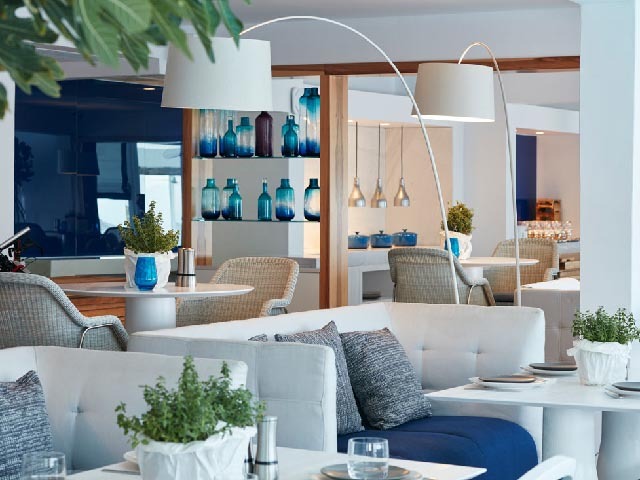 Light lunches are served (from 12pm–8pm) in the bar lounge or at your shaded lounger overlooking the ocean. 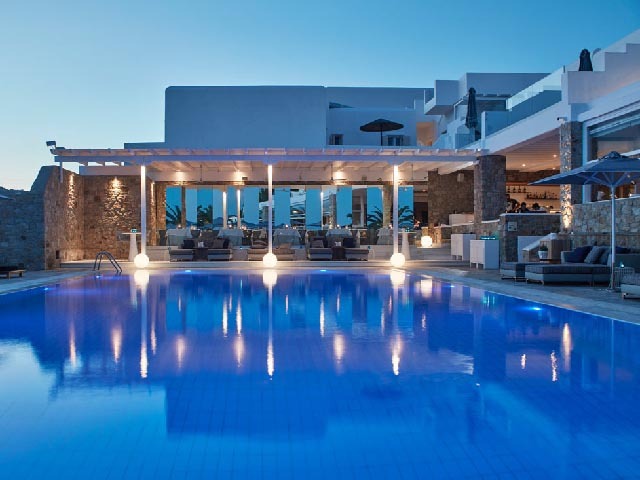 At sunset, guests returning from the beach mingle around the bar over a glass of wine or an aperitif before retiring to dress for dinner at Efisia or for an evening out on the town. Smooth cocktails are served well into the small hours of the morning. Naturally! IN-ROOM DINING:For those rare evenings when you feel like ‘staying home’ to catch up on sleep, work or TV entertainment, we offer a delicious in-room menu with something exceptional for everyone’s taste, guaranteed to arrive as hot or as chilled as the chef would have it. Excellent hotel, good location, but the best is the service! Great expirience in general. Book NOW and Save up to 40% !! Kids stay Free of Charge !! Free Cancellation !! Valid for the stay : 01.05.19 - 25.06.19 !! 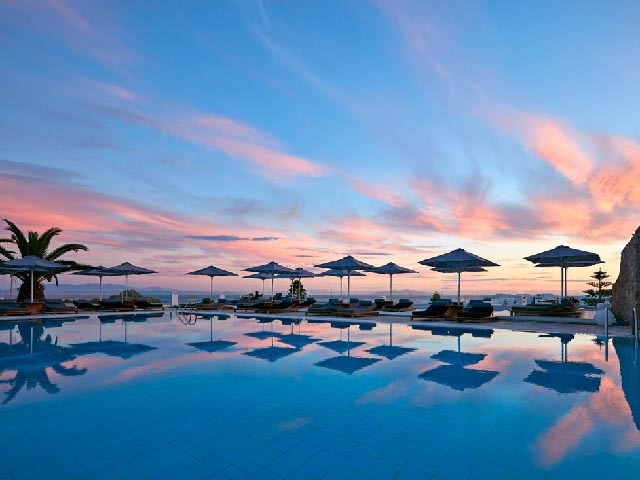 Book NOW and Save up to 40% !! Kids stay Free of Charge !! Free Cancellation !! 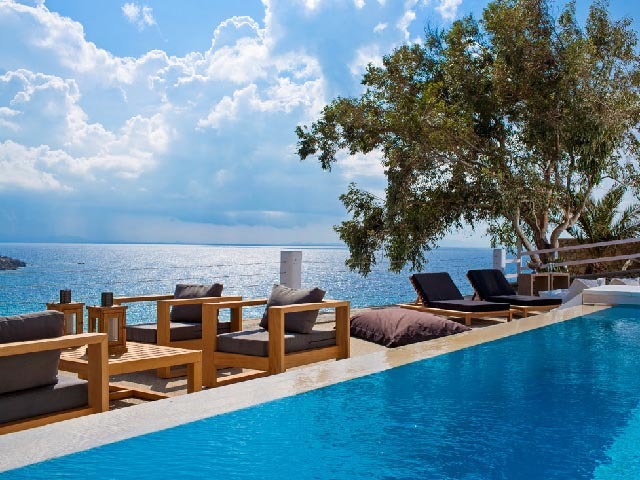 Valid for the stay : 31.08.19 - 30.10.19 ! !